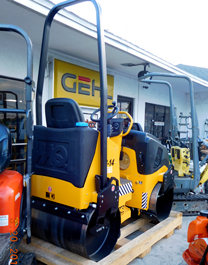 Recognized as the industry standard for compacting granular soils and asphalt. 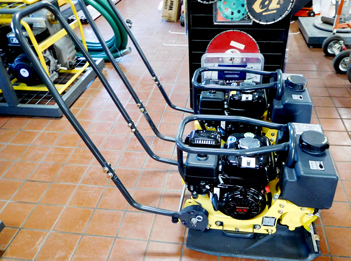 Reliable engine with Honda GX160 offering easy start-up and low oil shutdown for durability. 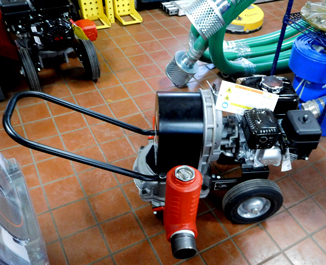 Cyclonic pre-cleaner captures most airborne contaminants for engine protection and extended service life. 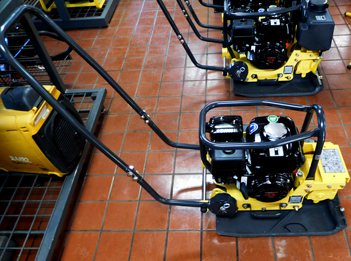 Anti-vibration handle dramatically reduces operator fatigue and increases productivity. 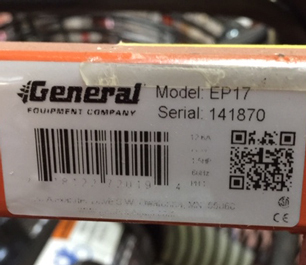 Solid, high-strenght steel base plate for durability. Tubular steel roll bar protects engine components and provides central lifting point. 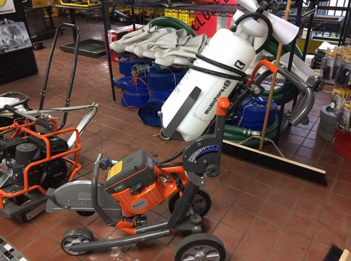 3″ Diaphragm Pump, 90 GPM, 50 ft MAX Head; Honda GX120 – MQ diaphragm pumps utilize a positive displacement design to effectively move high viscosity liquids, sludge, and general heavy debris laden fluids. Their simple reciprocating dynamics provide the force to successfully operate in the most demanding applications. 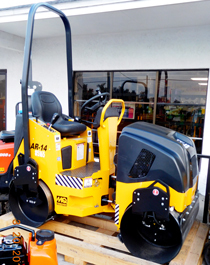 The Compact, 1-ton class AR14-Series roller delivers exceptional compaction performance on asphalt and granular soils. 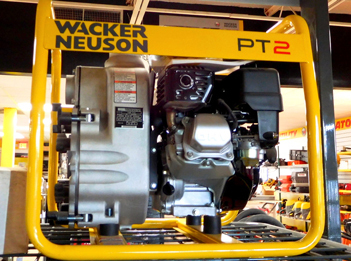 A wise investment for demanding construction professionals looking for versatility and productivity. Reliable Honda GX630 engine offers easy starting and exceptionally quiet operation. Compact design provides operator with clear line of sight for better steering. Positive pressure ventilators designed for the removal of airborne dust contamination fumes high ambient temperatures and other environmentally sensitive materials processed on construction and industrial job sites. High static capacity five blade MultiWing axial- type propeller. 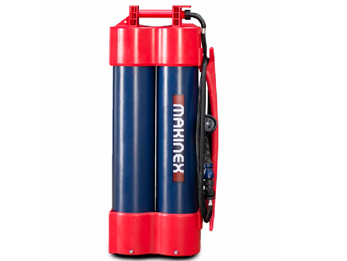 Portable, three phase submersible pumps are designed to handle water and solids. 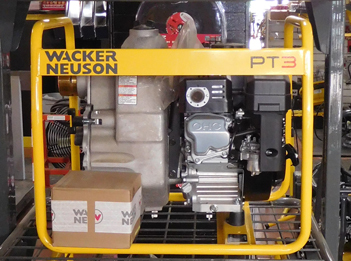 Built for the demands of construction, mining, municipality and farm applications. High efficiency, continuous duty motor with built-in thermal and over current motor protection increases motor life. 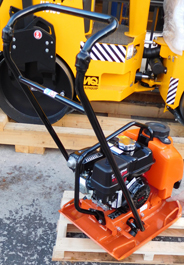 The Single Direction Vibratory Plate BVP18/45 offers top power, performance and reliability. 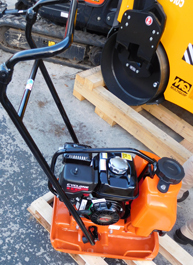 Its designed for the compaction of a wide variety of sand, gravel and granular base materials. Hot and cold asphalt patching. 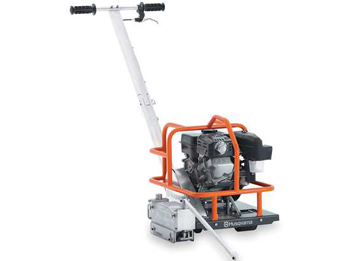 Powerful Husqvarna® all-around power cutter is ideal for cutting concrete and masonry in alteration, renovation and new construction work. 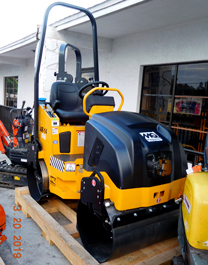 Used to cut small holes and adjust window and door openings as well as to cut curbstones and pavers in landscaping. * Price does not include taxes and freight cost. 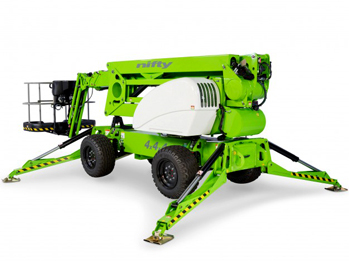 Niftylift TD50 tracked spider 50′ Platform lift. 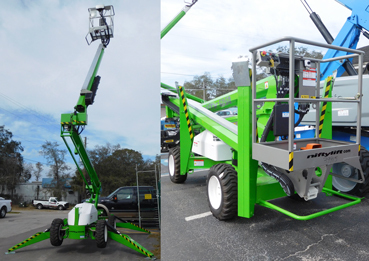 It offers a 56′ Work Height, with Rubber Tracks, Kubota Diesel Engine, and Hydraulic Outriggers/Stabilizers. 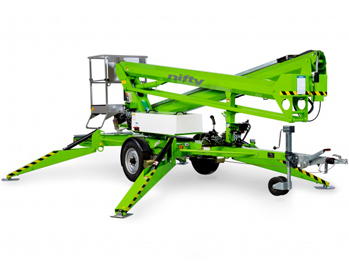 The SD50 work platform combines the best of our self-propelled and trailer mounted ranges. It offers the same reach capabilities as the TM50 but with the versatility of a robust yet very lightweight drivable base. 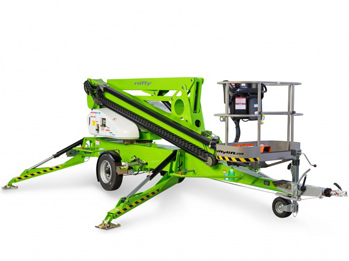 The SD64 work platform is the ultimate combination of our trailer mounted and self propelled product ranges. 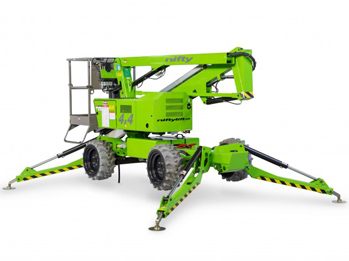 With full independent suspension and 4 wheel drive, the SD64 work platform can cope with a wide range of working environments and still offers the same impressive reach as the SP64. Low weight design makes the SD64 work platform economical and quick to transport. Please call at (813)971-9990 for a quote! 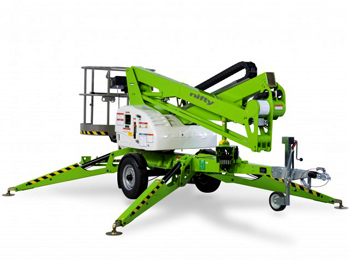 The TD42T TrackDrive cherry picker offers exceptional all-round performance from such a compact and low weight base, and with a 500lbs safe-working-load, plenty of capacity for tools as well. 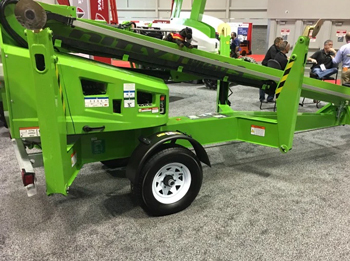 Weight-saving design means that site-to-site transportation is more economical and the TD42T TrackDrive access platform is also more efficient, allowing it to work for longer while using less fuel. Please call at (813)971-9990 for a quote! * Prices do not include taxes and freight cost. 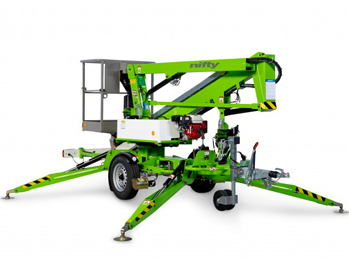 The TD34T access platform offers an impressive working envelope from a compact base with outstanding traction. The TD34T access platform delivers 60% gradeability with excellent traction on steep or rough terrain. 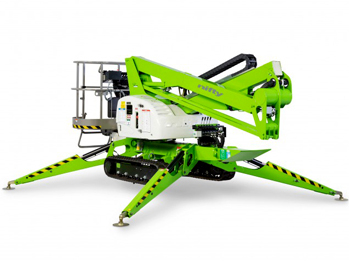 Weight-saving design means that site to site transportation is more economical and the TD34T access platform is also more efficient, allowing it to work for longer while using less fuel. 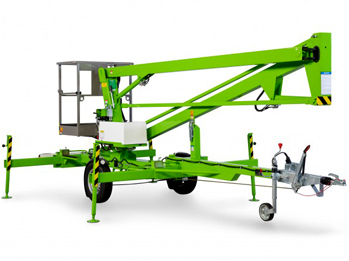 The SD34T work platform delivers an impressive working envelope and with the advantage of a telescopic upper boom, supreme accuracy when positioning the platform. Hydraulic outriggers and 45% gradeability allow the SD34T work platform to be driven and leveled on uneven surfaces making it ideal for environments with rough or softer grounds. Please call at (813)971-9990 for a quote! The TM34 is a robust and versatile trailer mount. It has retractable axles that allow it to pass through a 3ft 7in wide opening or doorway giving better access to applications. The TM34 trailer mount is a fast, cost effective and safe alternative to ladders and scaffolds. Please call at (813)971-9990 for a quote! The TM34T trailer mount is specifically designed to give maximum reach performance from the most compact chassis possible. By utilizing its versatile telescopic upper boom, the TM34T trailer mount to delivers unrivalled working outreach, especially at lower levels where it’s needed most. The TM40S trailer mount is specifically designed to give maximum horizontal outreach performance from the most compact chassis possible. Operation and maintenance are also made simple, due to fully proportional hydraulic controls minimizing both downtime and running costs. There are no complicated computer or circuit boards involved! Please call at (813)971-9990 for a quote! The Nifty TM64 has one of the largest unrestricted working envelopes in its class. Hydraulic outriggers make it quick and easy to set up and an optional traction drive system, operated from the platform, allows the TM64 to be positioned on site with minimal effort. Please call at (813)971-9990 for a quote! Developed specifically to maximize outreach at lower levels, the NiftyTM42T delivers unrivaled performance. 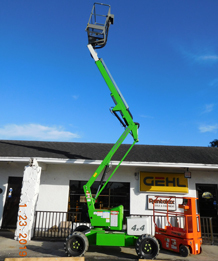 Its compact dimensions and hydraulic outriggers make maneuvering and setting up both quick and easy and its spacious 4ft 7in wide platform provides the operator plenty of room to work. Operation and maintenance are also made simple, due to fully proportional hydraulic controls minimizing both downtime and running costs. Please call at (813)971-9990 for a quote! 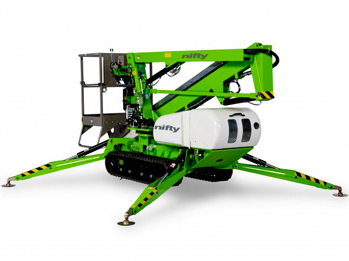 With one of the largest working envelopes in its class, the Nifty TM50 delivers maximum reach with stability and control. Octagonal boom sections provide strength without compromising on weight and the telescopic upper boom improves accuracy when positioning the platform. Hydraulically operated outriggers and controls make setting up and operating quick and easy, especially on uneven surfaces. Please call at (813)971-9990 for a quote! 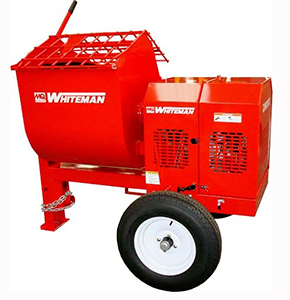 Whiteman mixers have the features, quality and engineering excellence perferred by the contractor and the equipment rental industry. See the Multiquip Morter Mixer WM90SH8 specifications here! 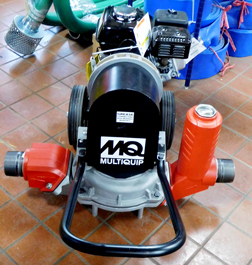 There’s only one real, heavy-duty plaster/mortar mixer worth taking home and it’s from Multiquip. 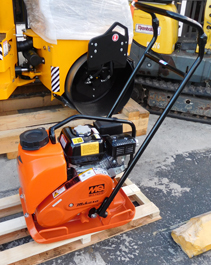 See the Multiquip Morter Mixer WM70SH8 specifications here! 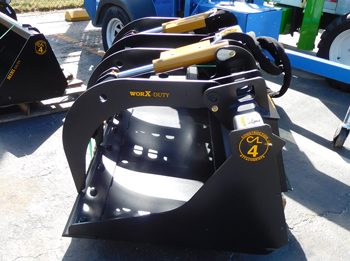 This Worx Duty Grapple Bucket is a heavy duty attachment designed for skid steer loaders and compact track loaders up to 100 horsepower. 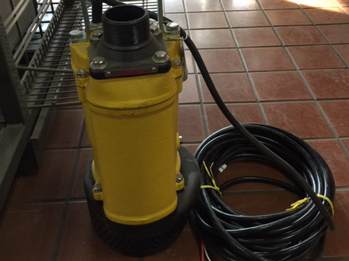 This attachment enables you to move hard-to-handle materials, brush and other awkward debris quickly and easily. 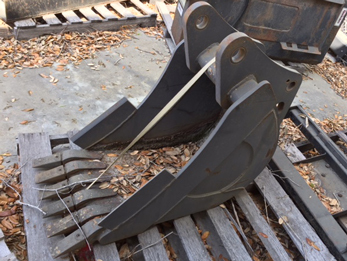 Grapple has up to 44″ of fully usable opening. 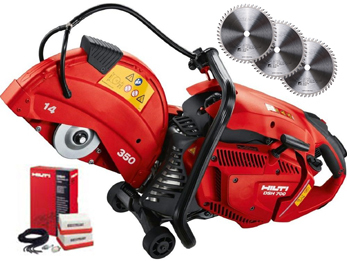 Item Number 33541266 – Includes 3x P Blades, 1x Maintenance Kit with 2x Air Filters, 5x Starter Ropes, 1x Spark Plug, 1x Fuel Filter, and 12 month wear and tear warranty. 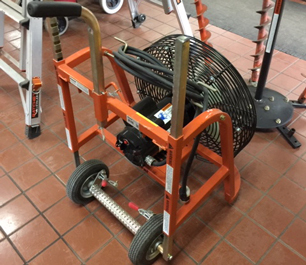 Item Number 3541268 – Includes 1x Maintenance Kit with 2x Air Filters, 5x Starter Ropes, 1x Spark Plug, and 1x Fuel Filter. 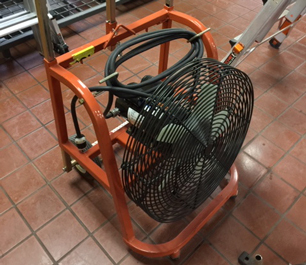 The Hose 2 Go is an easy to use dust suppression tool, blade cooling and portable water supply with constant water pressure. 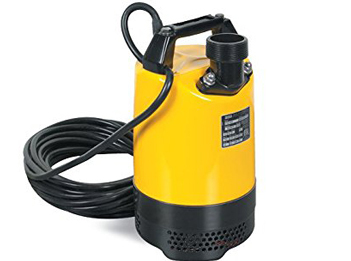 It has a constant flow of water that allows you to suppress the dust when cutting, core drilling and grinding concrete. It’s different to every other product on the market because it provides a constant water flow without the use of a pump, battery or electronics. 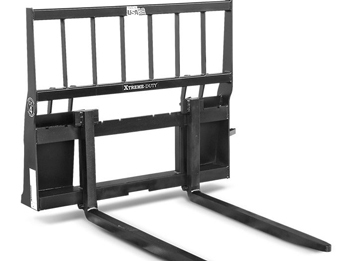 Pallet Forks designed for skid steer and tractor loaders with top guard designed for optimum visibility. The SP5014 series is a four-wheeled self-propelled unit designed to deliver maximum cutting power in hard to get to areas. 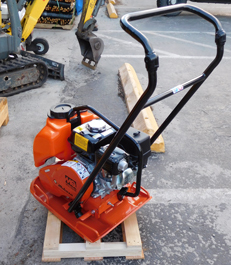 A unique dual speed ground system allows the SP5014 to travel faster than any other stump cutter on the market today. 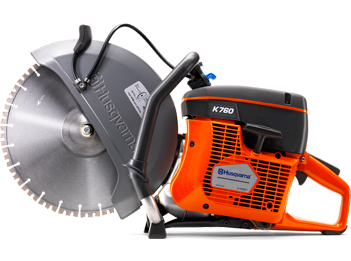 The unit also boasts a 1 1/4-inch thick, 21-inch diameter cutting wheel, letting you grind faster and smoother than ever before. 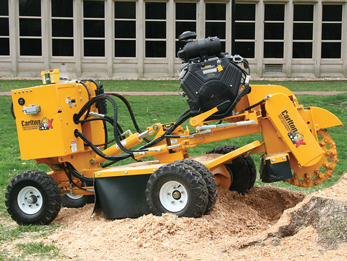 The SP5014 Stump Cutter features heavy-duty construction (1,650 pounds), hydraulic steering and four-wheel stance. This combination offers unmatched stability and maneuverability. See JP Carlton SP5014 Specifications here! The SP7015 TRX is truly a go anywhere do everything machine. 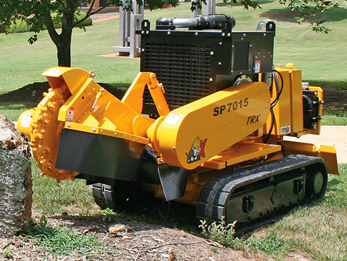 The SP7015 TRX Stump Cutter on tracks features a standard wireless remote control, 4 speed ground drive system, traction control, and telescoping tracks. 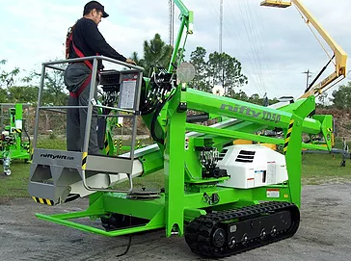 The unit’s track system hydraulically retracts from 48-inches to 35-inches so the operator can maneuver easily through tight situations like a back yard gate. 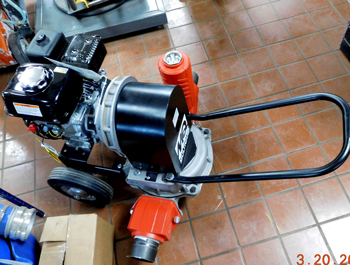 The SP7015 TRX packs big cutting power in a compact unit and produces only 5.3 psi ground pressure. See JP Carlton SP7015TRX Specifications here! Light weight and every detail developed with ergonomics in mind. 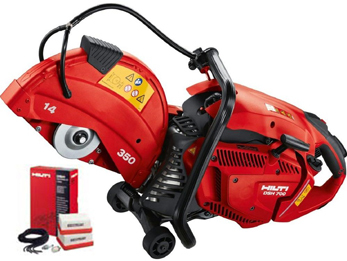 The outstanding power-to-weight ratio, the reliable start and exceptionally low vibrations (below 2.5 m/s2) mean less strain and maximized work time. The Soff-Cut 150 (Item No. 966844811) is designed for residential and light commercial applications. Features include a patented low noise blade enclosure which allows the unit to be used in residential areas with minimal disruption.